Bundled with other games in the series. The Gold version includes all the addons and is fully updated (except for unofficials). Also includes special Art of the Kill training videos. Unofficial commercial expansion for Falcon 3.0 that adds a greater degree of customization and planning to the game. Even capable of importing custom planes made with Falcon Test Pilot model editor. Formally available here, not available digitally. An addon involving the A-10 Thunderbolt was to be the game's fourth official expansion but it was never released. Patch 3.05 for the base game and Operation: Fighting Tiger, updating it to be on par with the Gold version, is available here. Separate versions for MiG-29 (1.04) and Hornet (1.02) are available here and here respectably. An unofficial one for networking issues of version 3.05 some user experience is available here (might be irrelevant to DOSBox users). All Gold versions (including digital) are fully updated except for the unofficial patch. Falcon 3.0 has MiG-29 and Hornet as their own executables, making it annoying to configure if you have the retail version. Luckily you can save the following as a .bat file and run it in DOSBox to get around this annoyance. 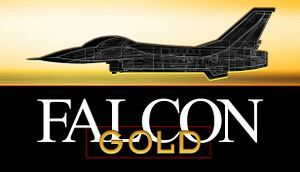 If used with Gold, you may have to replace the falcon3 command in the script with falconcd. falcon3.def is for the base game and Fighting Tiger expansion, mig29.def is for the MIG-29 expansion and hornet.def is for the Hornet expansion. Alt+↵ Enter while using DOSBox. Use Pause Emulation option for priority when using DOSBox. Modem only. Can be extended to 6 players if using DOSBox tunneling or other forms of IPX tunneling. Co-op is referred to as Allied and versus is referred to as duel in game. The game's intro video plays too slowly and the mission texts scroll too quickly when played in DOSBox. The hi-fidelity flight model also may have issues as well as SAMs. Reducing DOSBox's cycles will solve these issues but unfortunately the game will become too choppy to play when on missions. One simple solution is to switch to the "Complex" flight model which allows for correct joystick input. Changing timed=false in DOXBOX will also alleviate joystick calibration issues. Open PLAYER.CFG in a text editor. Mods and utilities for Falcon 3.0 can be found here. Warning some files are version specific and/or don't work on the latest version of the game. Additional mods could also be found by digging in cd.textfiles.com though this archive is far less organized. ↑ 2.0 2.1 File/folder structure within this directory reflects the path(s) listed for Windows and/or Steam game data (use Wine regedit to access Windows registry paths). Games with Steam Cloud support may store data in ~/.steam/steam/userdata/<user-id>/429520/ in addition to or instead of this directory. The app ID (429520) may differ in some cases. Treat backslashes as forward slashes. See the glossary page for details. This page was last edited on 29 March 2019, at 11:42.